We know that compression garments can be aggravating. Doctor prescribes them for you and then wonder why you are not wearing them. Let me guess why. Too hard or impossible to put on. They hurt, cutting in at the ankle. They hurt, cutting in at the top edge. The swelling comes back even when the stockings are on. Too hard or impossible to take off. I can’t blame you for not wearing them. I wouldn’t eather under those conditions. We have fitted patients for compression garments for over 6 years now. I can’t say that we get it right on the first try everytime but most of our patients end up wearing their compression stockings and are able to put them on and take them off. So what do we do different? First of all. Take care of the edema first. There is no point trying to squeeze an edematous limb in a compression garment. That is probably the most common problem with compression garment fitting. Sizing is crucial. If the limb changes in size during the day, then it is impossible to pick a correct size. Often patients are fitted for garments when the limb is swollen, resulting in the wrong size. Use a brand that has many sizing options. If there are only 4 different sizes, it is like bying a lottery ticket. It takes a lot of luck for one of those to fit you. We use the big brands Medi, Juzo, Jobst and Sigvaris. They offer sizing charts with 20-30 different options to get the best possible fit. Go custom. When a ready made garment does not work it may be necessary to custom fit. It does cost more but you can’t beat a custom fit. Medi custom allows you to return the garment as many times as you need to until it works right within 30 days. Find alternatives. When regular elastic compression garments are not an option there are alternatives. We use Non-elastic compression garments like the Juzo-Wrap. They are adjustable compression leggings that are made with Velcro closure straps. Learn how to put them on and take them off. We spend as much time as we need to to train our patients or caregivers in putting on and taking off compression garments. We have just about every invention made for putting on compression garments available in the office. Our patients can try them in the office and borrow them home to find out what will work best. Compression garments are needed daily to manage Lymphedema. A common reason for edema to return is because it is too difficult to put the stockings on. We have tried a variety of devices that are available and have most available devices in the office for our clients to try so you can decide what will work for you. We can guide you in the decision based on ours and other clients experience. Our patients can take the donning devices home and try before they decide to get one. Do you need to wear compression stockings but can not put them on or take them off? You are not alone. Perhaps you, or a loved one, need to wear compression garments to manage chronic edema (swelling) in your feet or legs. Without the compression socks the swelling gets worse. But how do you get them on when there is back pain, hip pain or joint pain in the hands? That is what our patients in our Lymphedema Clinic has faced. We have worked with over 1000 patients with this problem and have discovered many brilliant solutions for how to put compression stockings on. The first and best tool is simply a pair of gloves with rubber or latex grip. The gloves will protect the garments from fingernails and will provide good grip for rubbing the garments on. All gloves are not equal though. We have tested over a dussin gloves to find the ones that has the best grip on compression garments. Luckily it did not turn out to be the most expensive kind that worked best. The Easy Slide Magnide for closed toe stockings works great combined with gloves. It can be a little confusing at first but if you take the time to learn the technique it can be a breeze. Open toe stockings can be easier to apply because the slippie can be pulled out by the toes. There are a variety of slippie systems in different materials. Sometimes a slippie will be included with your open toe stockings. Take the time to learn how to use it. It is well worth it. Slippie systems work great when you can reach your feet or when a caregiver assists with putting stockings on. Obviously they do not help if one can not reach the feet. Lubricants work well together with gloves and/or a slippie system to further decrease of friction. The slippie systems only reaches the foot and ankle so the lotion is a good alternative if it is difficult to get the stocking the rest of the way up the calf, knee and thigh. It may seem expensive for such a small bottle but it only takes a few drops per application since the lotion does not absorb in the skin. I have tried ALPS fitting lotion and it works well. For additional help with rubbing the stockings on you can put a rubber mat on the floor and rub your foot against it. Juzo has a Easy Pad for this purpose that works well but I have patients that have used bathtub mats or rubber shelve lining material. When it is difficult to reach, or when the slippie system alone does not work, a frame may work well. There are a variety of frames in different brands. Some are wider for the calf, some are angled backwards and some have longer handles. This is sometimes the first method we try. Sometimes it is used together with some of the devices mentioned above. This is one of the most innovative of the devices. Since it came out it has become the most popular among our patients. By eliminating friction, it allows you to roll the stockings on without much effort. It takes a couple of tries to learn how to use it but when mastered it makes putting on stockings a piece of cake. For demonstration purposes, I have put a 30-40mmHg knee high stocking on top of my shoes using the Doff ‘N Donner. It also works great for removing stockings. This is a tool that we found in the Netherlands and have tried. It is more costly but in our opinion the best because of its long and sturdy handle that limits the need to reach low and because it also works for removing the garments. Unfortunately The Steve donning device has only been available in Europe. After waiting a couple of years for someone to begin distributing this product in USA we have decided to import a few to make them available. Sometimes all it takes to give the last push off the foot is a traditional dressing stick. They can be found at most medical supply stores. It has a rubber coated down turned hook that can be used to get the last of the stocking over the heel. This does require some arm and hand strength and does not always work. Another tool that works for some for the last push is the Medi Butler Off. So far the only product we have found for removing stockings by decreasing friction is the Easy Off by Arion. Same maker as the Easy Slide Magnide (see above). Combined with gloves and/or a rubber pad on the floor it is an excellent way to ease the removal of stockings. Granted that the person can reach the feet. The Doff “N Donner is a new and surprisingly simple way to remove stockings. It has become the most popular of our devices since it came out in 2012. The real challenge comes when a person can not reach the feet. 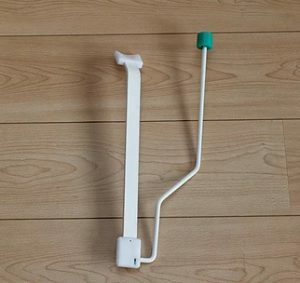 There are ways to put stockings on without reaching the feet, but we have not found a good tool for removing stockings without reaching and bending at the hip in the US. As mentioned above, The Steve from the Netherlands has a simple but effective way to do both. Since they are not available anywhere else in the US for retail we decided to import a few. The Ezy Off is a simple but very effective way to get compression garments off. It can even be used with one hand. The design allows you to use the leg muscles and eliminates the need for bending down. It does take some learning.